Someone pinch me! Wait, don't because then that means I have to wake up and go run 26.2 miles in this blessed heat! Oh, that's happening no matter what? Okay fine! So, here we go. I made a checklist for myself for the LA Marathon and I am sharing it with you! These are the things I will pack and the things I will need! The above is Jenn's order but one of those pink ones are mine! Can't wait! Have you heard of QTees? You can design the colors in the design of your choice! Fun right? I decided to go with my trusty Spandits black skirt in the Abyss pattern. If it is going to be 700 degrees, I need to be well hydrated and can't count on course support for all my hydration needs. So my awesome VP2 pack to the rescue - AGAIN! I am probably going to wear the one pictured. I think it will go well with my pink and white theme! And now that I say that, I may go with the above pink skirt too. Hmm..this pattern is called Hyperspeed. This will go in my hydration pack to drink. And this is what I will eat. I couldn't find a picture of the sweet potato flavor so I am posting a picture of my second favorite - Banana Beet Ginger. YUM! Most people either love them or hate them. The % of haters seems to increase with the sweet potato but I love that stuff! They have new oatmeal flavors now too! Yes please! 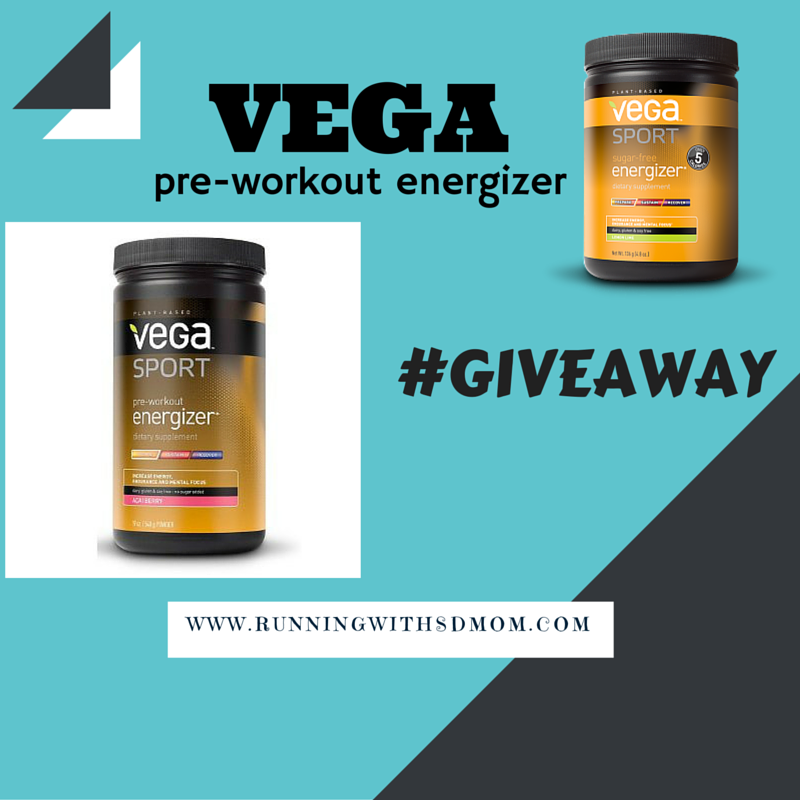 I must have this 20 minutes before I run for a quick charge from the caffeine and some pure energy. I have a giveaway going on for it right now. Check it out! Obviously I need my shoes to run. But I really can't decide which ones! 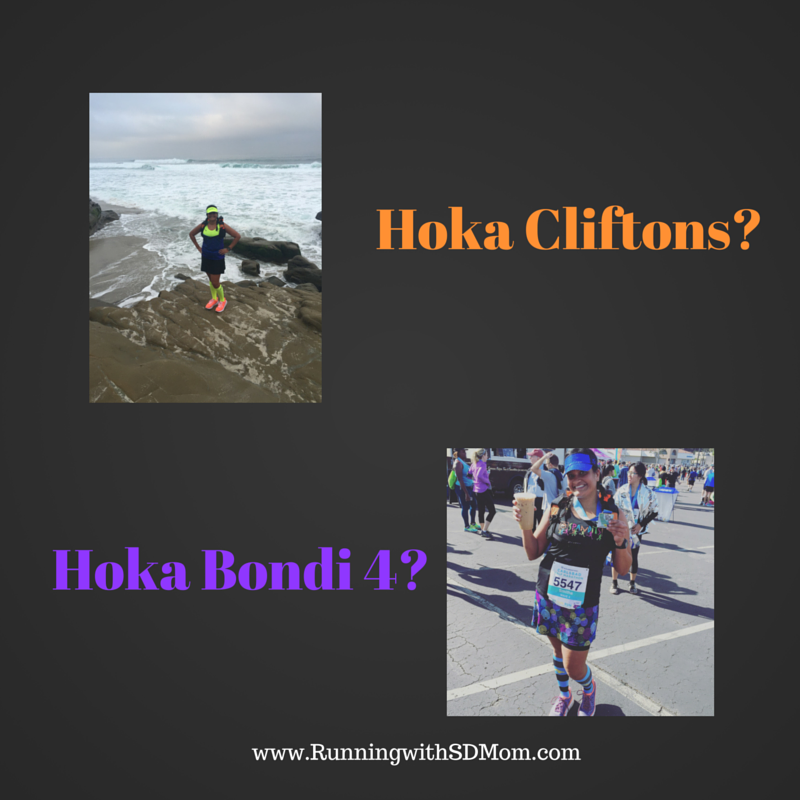 Should I run in the new favorite Cliftons (which I have never run in more than 15 miles) or the tried and tested Bondi 4's? This is the hardest decision! Writing this post, I realize I have never done a marathon without my Jenn. She was there with me in Phoenix. There with me for Revel. And now, she will be by my side for LA. She can run WAY faster than me but agrees to stay with me. Because she is a true friend! She knows I have been lacking in motivation and her dirty jokes at Mile 12 and singing at Mile 23 will get me thru! Or 5 hours but who is counting! 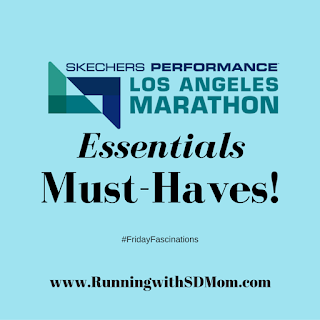 Bonus mentions: SportShield, Moving Comfort Juno bra, Superfeet Green insoles, Garmin 620 and a GREAT attitude! So there you have it. 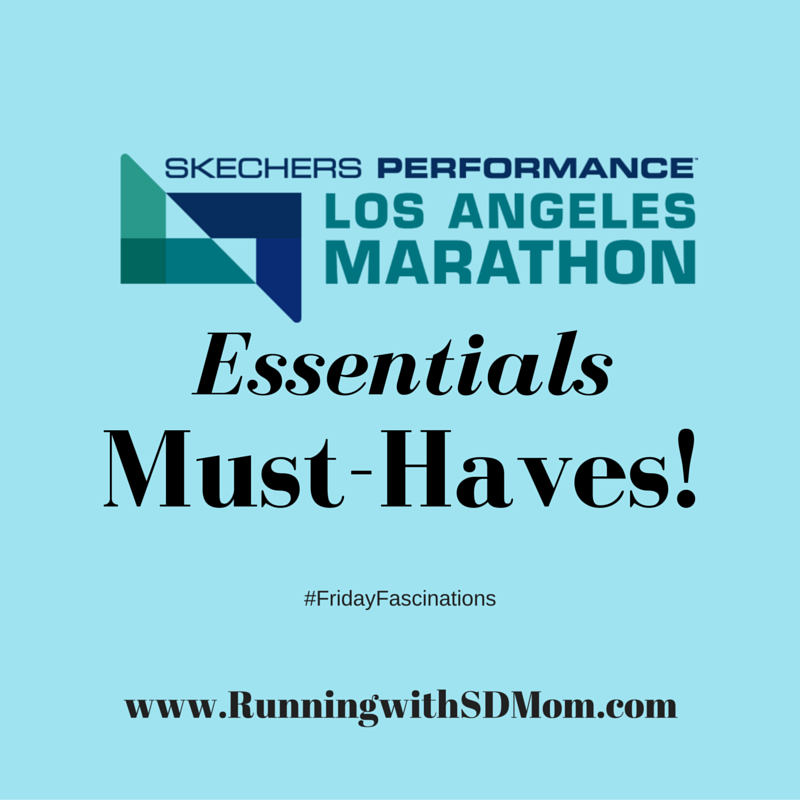 10 things plus some bonuses I MUST have to make my LA Marathon race day successful. Please help me decide what to do about the shoes and the skirt! Bondi 4s or Cliftons? Black skirt or the Hyperspeed? 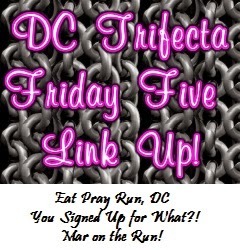 Before I forget, I am linking up with Mar, Courtney and Cynthia - AKA the DC Trifecta! 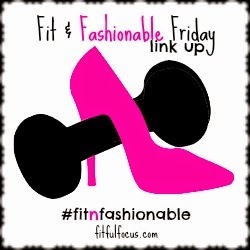 I am also linking up with Nicole for Fit & Fashionable Friday! 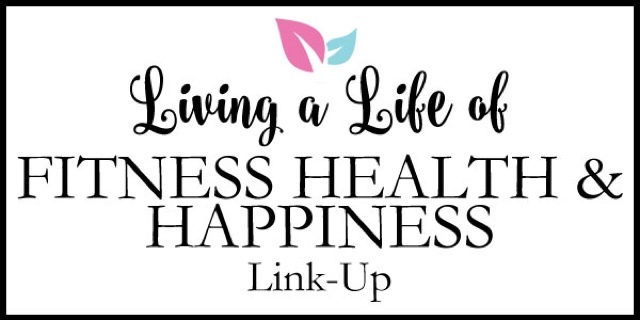 And Jill for Fitness, Health & Happiness Link-Up! What do you think I am missing? Good to go? Will someone call in a favor and make the weather a beautiful 55 degrees? Please and thank you! You have heat? 55 degrees would be perfect! I like the black skirt, it will make the other pick items pop! Good luck! I like the black skirt too but not sure it will be the best for 90 degrees. Best wishes to you! I heard it is going to be hot. EEEk! We could always use a Jenn, what a great friend! I hope you have a wonderful race. Jenn is the absolute best. And a great coach too! I love that you have a friend to run marathons with, that would be super motivating. Have a great race this weekend and stay hydrated. The friend makes the race! Wow! I really have been with you for all your marathons. I feel really honored to have these experiences with you. I love that I get to be there for you as you accomplish your goals. I need to think of some new dirty jokes for this weekend!! I hope you have good ones. Maybe dirty jokes about the heat? You have some of my favorites in there! I've never seen those Clif pouches - I'll have to go on a hunt! Have a fab fab fab race! They are so good and no chewing! Can we split the difference? I love the Valentine's ProCompression socks, meant to order but forgot :( Hope you have great weather! Those socks of the month are selling FAST! I am leaning towards it but I do have one more skirt I am bringing. Race time decision. Cliftons!! And ice cubes - put them in your bra. That's what I am going to do!! Have a great run! Hope to see you! Hope I see you! I added my Stinsons to the mix...I may wear those! Thank you! Love my socks! Love those QTees! Will have to check that out - how fun! freeze your drink the night before. Hating the heat for you guys. Hydrate. Yeah, I am not a fan. Good tip on the bottle freezing! Good luck! I'm thinking I have to get one of those Orange Mud backpacks for Big Sur. Goodluck during your race. I wish I was in heat now. So much better than being in negative digits here in central PA. The Orangemud pack will definitely be handy during the heat. I used it for my 50k and it worked great. I will be linking to you tomorrow. Well now I'm wondering which thing you forgot! I hope you had a great race - and survived the heat! FridayFascinations: Things I am Loving this Week!